I just got an email from a friend and thought that a feel-good post was in order. 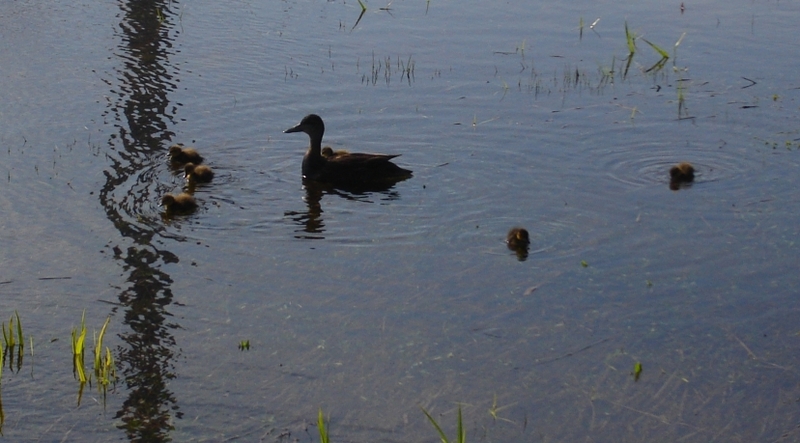 Recently, a duck hatched out nine ducklings up around the Memorial University of Newfoundland, near the Business School. Everything was going fine, until one day they wandered over a storm sewer. Suddenly, Momma Duck was left with only two of her progeny. Concerned students, staff, campus enforcement, facilities management, faculty and well-wishers gathered above the grate bearing picks, a long handled "scoop" shovel, a small recycling bin, and a fire hose. Hovering nervously was the distraught mother. The seven ducklings had fallen through the grate and were trapped in the sewer pipe that runs under the road. With skill and aplomb, the rescuers gathered each duckling up and returned them to the mother duck. The last duckling was a bit of a trick, though, as he had gone further into the pipe than the others. The fire hose was used to gently flush him out the other end, ducky waterslide-style. The family was last seen headed towards Long Pond. You can seen a photolog of the rescue, as compiled by Moya Clarke. Talk about the trials of motherhood! In many parts of Halifax the ducklings don’t last long. The main culprits are the seagulls. Here’s to the NLDRS (Newfoundland and Labrador Duckling Rescue Society). Is there a Miss Bianca on staff?